Colleen Curry, “A British Mother Reportedly Left Welfare Behind and Is Now Helping Recruit For The Islamic State,” Vice News, December 22, 2014, https://news.vice.com/article/a-british-mother-reportedly-left-welfare-behind-and-is-now-helping-recruit-for-the-islamic-state. Almost immediately following the attack Hussain praised Simpson and Soofi on Twitter and called for death to “those That Insult the Prophet.”Evan Perez, Pamela Brown, and Jim Sciutto, “Texas attacker had private conversations with known terrorists,” CNN, May 7, 2015, http://www.cnn.com/2015/05/07/politics/fbi-warning-elton-simpson-cartoon-event-attack/index.html. Hussain also stands accused of directly communicating with and encouraging U.S. terror suspect Usaamah Abdullah Rahim to carry out an attack on U.S. soil.Brett Gibbons, “Kings Heath terrorist Junaid Hussain gave bomb tips to extremist planning UK attack,” Birmingham Mail, April 1, 2016, http://www.birminghammail.co.uk/news/midlands-news/kings-heath-terrorist-junaid-hussain-11125081; Jack Moore, “Briton Who Plotted U.S. Soldier Beheading Had Deadly Links to ISIS Cyber Chief in Syria,” Newsweek, April 1, 2016, http://www.newsweek.com/brit-who-plotted-us-soldier-beheading-had-deadly-links-isiss-cyber-chief-syria-443071. Hussain also allegedly sought to incite violence against Jon Ritzheimer, a former U.S. Marine who organized a controversial Draw Muhammad contest in Phoenix, Arizona, in response to the contest in Garland.David Francis, “Islamic State Calls for Lone-Wolf Attack on Arizona Man Planning Muslim Protest,” Foreign Policy, May 29, 2015, https://foreignpolicy.com/2015/05/29/islamic-state-calls-for-lone-wolf-attack-on-arizona-man-planning-muslim-protest/. U.S. officials confirmed Hussain’s death is a U.S. drone strike in Syria in late August, 2015.“UK jihadist Junaid Hussain killed in Syria drone strike, says US,” BBC News, August 27, 2015, http://www.bbc.com/news/uk-34078900. In January 2016, 20-year-old Kosovar hacker Ardit Ferizi was charged in a U.S. court for hacking personal information of American service members. Ferizi reportedly released personal details of 1,300 U.S. military and government personnel to Hussain, who posted the information online in August 2015.Pete Williams, “Hacker Accused of Giving Military Personal Data to ISIS in U.S. Court,” NBC News, January 27, 2015, http://www.nbcnews.com/news/us-news/hacker-accused-giving-military-personal-data-isis-u-s-court-n505406. Hussain, who grew up in England, fled the United Kingdom for Syria in July 2013 to join ISIS.Elliott C. McLaughlin, “ISIS jihadi linked Garland attack has long history as hacker,” CNN, May 7, 2015, http://www.cnn.com/2015/05/06/us/who-is-junaid-hussain-garland-texas-attack/; Colleen Curry, “A British Mother Reportedly Left Welfare Behind and Is Now Helping Recruit For The Islamic State,” Vice News, December 22, 2014, https://news.vice.com/article/a-british-mother-reportedly-left-welfare-behind-and-is-now-helping-recruit-for-the-islamic-state. U.S. and British authorities believe Hussain was part of an ISIS group of British jihadists dubbed “the Beatles,” one of whom executed American journalist James Foley in 2014.Nick McCarthy and Amardeep Bassey, “FBI to hunt Jihadists in our midst as Birmingham man linked to beheading of James Foley,” Birmingham Mail, August 24, 2014, http://www.birminghammail.co.uk/news/midlands-news/fbi-hunt-jihadists-midst-birmingham-7663367. The group also included the terrorist known as Jihadi John. Hussain later offered to reveal Jihadi John’s identity to the British newspaper the Daily Mail in return for payment but the paper refused.Abdul Taher, “IS fighter said ‘I’ll identify Jihadi John…if you buy me a £3k car’: British extremist who once hacked Tony Blair’s personal details attempts to bribe the Mail on Sunday,” Mail on Sunday (London), November 1, 2014, http://www.dailymail.co.uk/news/article-2817329/IS-fighter-said-ll-identify-Jihadi-John-buy-3k-car-British-extremist-hacked-Tony-Blair-s-personal-details-attempts-bribe-MoS.html. Hussain used his “Abu Hussain al Britani” Twitter persona to recruit for ISIS and call for violence.Ewen MacAskill, “Briton lead suspect after US Central Command’s Twitter account is hacked,” Guardian (Manchester), January 14, 2015, http://www.theguardian.com/us-news/2015/jan/14/briton-suspect-us-central-command-twitter-hack-junaid-hussain-tony-blair. He used Twitter to promise the jihadi flag would fly over the White House and Downing Street,Brett Gibbons, “Birmingham hacker Junaid Hussain among Brits fighting in Syria,” Birmingham Mail, June 19, 2014, http://www.birminghammail.co.uk/news/midlands-news/birmingham-hacker-junaid-hussain-syria-7291864. call for the murder of Israeli diplomats, and pledge to wage jihad until death.Nick McCarthy and Amardeep Bassey, “FBI to hunt Jihadists in our midst as Birmingham man linked to beheading of James Foley,” Birmingham Mail, August 24, 2014, http://www.birminghammail.co.uk/news/midlands-news/fbi-hunt-jihadists-midst-birmingham-7663367. Twitter deleted Hussain’s accountsMark Hosenball, “British hacker linked to attack on Pentagon’s Twitter feed: sources,” Reuters, January 13, 2015, http://www.reuters.com/article/2015/01/14/us-cybersecurity-pentagon-cybercaliphate-idUSKBN0KN00X20150114. but he quickly creates new ones, such as the one he used to communicate with Simpson in Texas.Evan Perez, Pamela Brown, and Jim Sciutto, “Texas attacker had private conversations with known terrorists,” CNN, May 7, 2015, http://www.cnn.com/2015/05/07/politics/fbi-warning-elton-simpson-cartoon-event-attack/index.html. 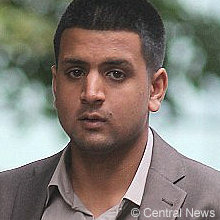 Authorities believe Hussain was involved in a 2014 ISIS plot to steal millions of dollars through a series of cyberattacks on British banks.Russell Myers, “Jihadist hackers targeting celebrity and business bank accounts to fund Islamic State terror campaign,” Daily Mirror (London), August 15, 2014, http://www.mirror.co.uk/news/uk-news/jihadist-hackers-targeting-celebrity-business-4057294. Hussain reportedly led ISIS’s CyberCaliphate hacker group, which hacked the U.S. Central Command’s social media accounts in January 2015.Mark Hosenball, “British hacker linked to attack on Pentagon’s Twitter feed: sources,” Reuters, January 13, 2015, http://www.reuters.com/article/2015/01/14/us-cybersecurity-pentagon-cybercaliphate-idUSKBN0KN00X20150114; Ewen MacAskill, “Briton lead suspect after US Central Command’s Twitter account is hacked,” Guardian (Manchester), January 14, 2015, http://www.theguardian.com/us-news/2015/jan/14/briton-suspect-us-central-command-twitter-hack-junaid-hussain-tony-blair. The following month, the CyberCaliphate hacked various U.S. and international media companies and threatened First Lady Michelle Obama and the Obama children over Twitter.Michael Martinez, “Cyberwar: CyberCaliphate targets U.S. military spouses; Anonymous hits ISIS,” CNN, February 11, 2015, http://www.cnn.com/2015/02/10/us/isis-cybercaliphate-attacks-cyber-battles/index.html. While the CyberCaliphate’s attacks have largely been to gain publicity for ISIS, cyber security experts warn the group could cause massive damage to global critical infrastructure.Emma Graham-Harrison, “Could Isis’s ‘cyber caliphate’ unleash a deadly attack on key targets,?” Guardian (Manchester), April 12, 2015, http://www.theguardian.com/world/2015/apr/12/isis-cyber-caliphate-hacking-technology-arms-race. Hussain was involved in cybercrime since he was a teenager. At age 18, Hussain was part of a British hacker group called Team Poison. The group famously hacked former British Prime Minister Tony Blair’s email account and released personal information online. The group also attacked Scotland Yard, NATO, and the British National Party, and worked with the hacker group Anonymous to target banks.Hannah Furness, “Team Poison: profile of the hackers,” Telegraph (Kent), April 12, 2012, http://www.telegraph.co.uk/technology/9200751/Team-Poison-profile-of-the-hackers.html. Hussain went to prison for six months for the Blair hack.“‘Team Poison’ hacker who posted Tony Blair’s details is jailed,” Telegraph (Kent), July 27, 2012, http://www.telegraph.co.uk/technology/internet-security/9432459/Team-Poison-hacker-who-posted-Tony-Blairs-details-is-jailed.html. A former Team Poison member told CNN that Hussain was capable of stealing millions of dollars through cyberattacks.Elliott C. McLaughlin, “ISIS jihadi linked Garland attack has long history as hacker,” CNN, May 7, 2015, http://www.cnn.com/2015/05/06/us/who-is-junaid-hussain-garland-texas-attack/l. In April 2016, the U.S. Justice Department revealed that Hussain had communicated with Usaamah Abdullah Rahim ahead of the 26-year-old’s June 2015 attack on police officers and FBI agents, during which he was killed. According to court documents, Hussain had encouraged Rahim to kill political activist and critic of Islam Pamela Gellar, who had recently organized a the Prophet Muhammad contest in Texas May 3. Instead, Rahim chose to attack the police.Adam Goldman, “Well-known ISIS operative instructed Americans to kill organizer of Muhammad cartoon contest, prosecutors reveal,” Washington Post, April 22, 2016, https://www.washingtonpost.com/news/post-nation/wp/2016/04/21/well-known-isis-operative-instructed-americans-to-kill-organizer-of-muhammad-cartoon-contest-prosecutors-reveal/. Earlier that month, prosecutors in the trial of British terrorist Junead Khan revealed that he and Hussain had exchanged several messages over the online app Surespot about targeting U.S. military personnel in Britain. Hussain reportedly told Khan he could provide addresses of U.S. soldiers based in the United Kingdom. Hussain also said he would provide a manual for making a pressure-cooker bomb. Khan was arrested in July 2015 and convicted of preparing a terrorist act.Brett Gibbons, “Kings Heath terrorist Junaid Hussain gave bomb tips to extremist planning UK attack,” Birmingham Mail, April 1, 2016, http://www.birminghammail.co.uk/news/midlands-news/kings-heath-terrorist-junaid-hussain-11125081; Jack Moore, “Briton Who Plotted U.S. Soldier Beheading Had Deadly Links to ISIS Cyber Chief in Syria,” Newsweek, April 1, 2016, http://www.newsweek.com/brit-who-plotted-us-soldier-beheading-had-deadly-links-isiss-cyber-chief-syria-443071. @AbuHussain_6CEP, Twitter post, July 9, 2015, 7:40 a.m., https://twitter.com/FightExtremism/status/619154066766200833. @AbuHussain_8CEP, Twitter post, July 9, 2015, 7:37 a.m., https://twitter.com/FightExtremism/status/619153477479067648. @Abu_Hussain_10AbuHussainAlBritani, Twitter, accessed July 16, 2015, https://twitter.com/AbuHussain_10. @AbuHussain_16Qaqa Afro, Twitter post, August 9, 2015, 11:39 a.m., https://twitter.com/abuQafro/status/630448444633690116. @AbuHussain_18Abu Khaled the Australian, Twitter post, August 12, 2015, 2:39 a.m., https://twitter.com/AbuK313/status/631399612251807744. @AbuHussain_23Abu Khaled the Australian, Twitter post, August 12, 2015, 10:42 a.m., https://twitter.com/AbuK313/status/631521132655603712. Jenaid HusseinEvan Perez, Pamela Brown, and Jim Sciutto, “Texas attacker had private conversations with known terrorists,” CNN, May 7, 2015, http://www.cnn.com/2015/05/07/politics/fbi-warning-elton-simpson-cartoon-event-attack/index.html. AbuHussainAlBritaniAbuHussainAlBritani, Twitter, accessed July 16, 2015, https://twitter.com/AbuHussain_10. Abu Hussain Al BritaniKieran Corcoran, “British hacker ‘masterminding plan to teach jihadists how to steal from bank accounts of rich and famous to fund terror campaign,’” Daily Mail (London), August 16, 2014, http://www.dailymail.co.uk/news/article-2726522/British-hacker-masterminding-plan-teach-jihadists-steal-bank-accounts-rich-famous-fund-terror-campaign.html. TriCk“‘Team Poison’ hacker who posted Tony Blair’s details is jailed,” Telegraph (Kent), July 27, 2012, http://www.telegraph.co.uk/technology/internet-security/9432459/Team-Poison-hacker-who-posted-Tony-Blairs-details-is-jailed.html. Junaid Hussain was a British computer hacker and member of ISIS, according to U.S. officials. It would be “best to have at least pipe bombs or pressure cooker bomb in a backpack incase something happens, so u can do isthishadi bomb (suicide bomb) incase they try to arrest u.”Jack Moore, “Briton Who Plotted U.S. Soldier Beheading Had Deadly Links to ISIS Cyber Chief in Syria,” Newsweek, April 1, 2016, http://www.newsweek.com/brit-who-plotted-us-soldier-beheading-had-deadly-links-isiss-cyber-chief-syria-443071. An attack in the UK is long over due…” (Tweet)AbuHusainAlBritani, Twitter post, July 15, 2015, 7.25 p.m.
“Another Lee Rigby style beheading is longggg over due!! 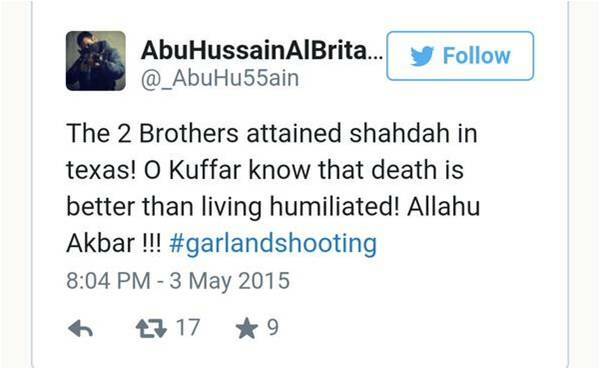 (Tweet)AbuHusainAlBritani, Twitter post, July 15, 2015, 7.33 p.m.
“The 2 Brothers attained shahdah in texas! O Kuffar know that death is better than living humiliated! Allahu Akbar !! !” (Tweet)Paul Farrell and Damien Gayle, “Texas shooting: Two gunmen shot dead outside Muhammad exhibition – rolling coverage,” Guardian (Manchester), last updated May 4, 2015, http://www.theguardian.com/us-news/live/2015/may/04/two-gunmen-shot-dead-in-texas-outside-muhammad-cartoon-exhibition-rolling-coverage. “Kill those That Insult the Prophet.” (Tweet)Jocelyn, Twitter post, May 3, 2015, 10 p.m., https://twitter.com/LadySig45/status/595045391873126400. 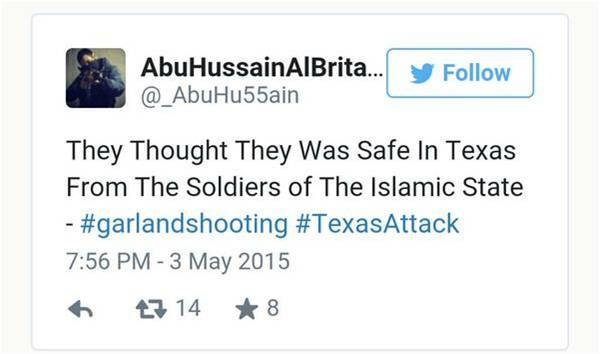 “They Thought They Was [sic] Safe In Texas From The Soldiers of The Islamic State - #garlandshooting #TexasAttack.” (Tweet)Jocelyn, Twitter post, May 3, 2015, 10 p.m., https://twitter.com/LadySig45/status/595045391873126400. 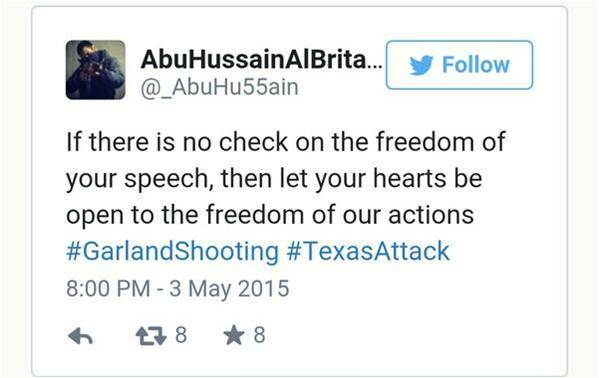 “If there is no check on the freedom of your speech, then let your hearts be open to the freedom of our actions #GarlandShooting #TexasAttack.” (Tweet)Jocelyn, Twitter post, May 3, 2015, 10 p.m., https://twitter.com/LadySig45/status/595045391873126400. “And know that the one who kills for the sake of His Lord will never go to the same place as the one he killed.” (Tweet)Darshna Soni, “British IS fighters express glee over journalist’s murder,” Channel 4 News (U.K.), August 21, 2014, http://www.channel4.com/news/british-is-fighters-glee-over-journalists-murder-james-foley-islamic-state-. “You can sit at home playing Call of Duty or you can come here and respond to the real call of duty... the choice is yours.” (Tweet)Nick McCarthy and Amardeep Bassey, “FBI to hunt Jihadists in our midst as Birmingham man linked to beheading of James Foley,” Birmingham Mail, August 24, 2014, http://www.birminghammail.co.uk/news/midlands-news/fbi-hunt-jihadists-midst-birmingham-7663367. “Wallahi if u cared about #Gaza you would raid them embassies that u all stand outside & behead the first ambassador or #IDF soldier u see! !” (Tweet)Nick McCarthy and Amardeep Bassey, “FBI to hunt Jihadists in our midst as Birmingham man linked to beheading of James Foley,” Birmingham Mail, August 24, 2014, http://www.birminghammail.co.uk/news/midlands-news/fbi-hunt-jihadists-midst-birmingham-7663367. “We pledge to wage jihad for the rest of our lives until either we implant Islam all over the world or meet our Lord as bearers of Islam.” (Tweet)Nick McCarthy and Amardeep Bassey, “FBI to hunt Jihadists in our midst as Birmingham man linked to beheading of James Foley,” Birmingham Mail, August 24, 2014, http://www.birminghammail.co.uk/news/midlands-news/fbi-hunt-jihadists-midst-birmingham-7663367. “One day the flag of tawheed will fly over Downing Street and the White House.” (Tweet)Brett Gibbons, “Birmingham hacker Junaid Hussain among Brits fighting in Syria,” Birmingham Mail, June 19, 2014, http://www.birminghammail.co.uk/news/midlands-news/birmingham-hacker-junaid-hussain-syria-7291864. “We hear you and we will help you if you accept Islam and reject corrupt man-made laws like democracy and pledge your allegiance to Caliph Abu Bakr and then we will shed our blood for you and send our soldiers that don’t sleep, whose drink is blood, and their play is carnage.” (Tweet)David Francis, “Meet the Star-Crossed Lovers Behind the Islamic State’s Centcom Hack,” The Cable, January 14, 2015, http://foreignpolicy.com/2015/01/14/meet-the-star-crossed-lovers-behind-the-islamic-states-centcom-hack/. “Tony Blair’s Private Info is getting leaked tonight, so is his Personal Adivsors [sic] CV and UK MPs & Lords who supported the war in Iraq.” (Tweet)Peter Hutchinson, “Tony Blair’s personal details ‘hacked,’” Telegraph (Kent), June 25, 2011, http://www.telegraph.co.uk/news/politics/tony-blair/8598172/Tony-Blairs-personal-details-hacked.html.